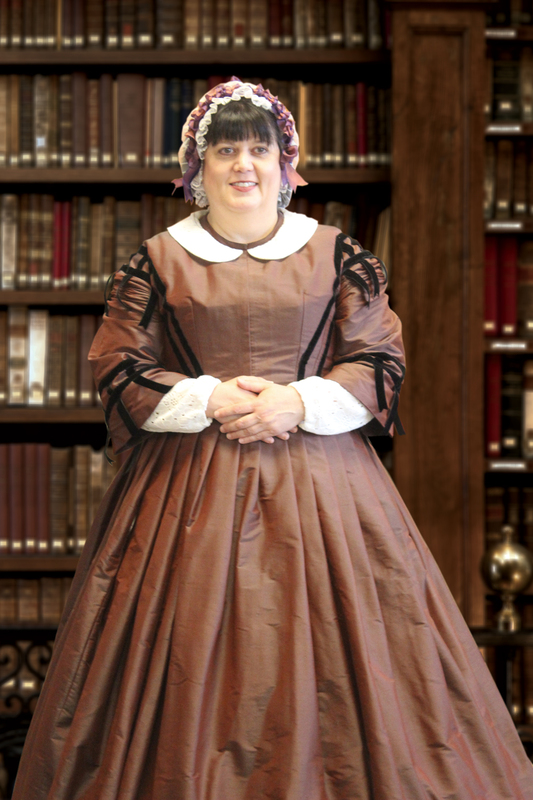 Some of you have visited me during my various appearances as Florence Nightingale at bookstores and conferences, and I am very grateful for your attendance. I have been asked about my research for this role, and I’m happy to share it first with my newsletter readers. She took me in hand and showed me what undergarments I needed and how to put them on. Pantaloons, chemise, corset, socks, and boots all got added to the shop’s counter, after I was taught exactly how to fasten and lace a corset by myself. Then she sent me off to a fabric store to purchase silk taffeta, a cloth that would have been a popular choice for a woman of Florence’s station in 1854. Naturally, I managed to buy the wrong thing, so then there was a bit of a fuss in getting it exchanged. The Gettysburg seamstress constructed the main part of the dress then shipped it to me, where I had it “finished” by local seamstress Dana Dement of North Beach, Maryland. Dana made my headpiece, lace collar, and undersleeves, as well as doing a final fitting/hemming. To prepare for the role itself, I re-read a couple of biographies of Florence, then typed up several pages of important dates, critical people in her life, and blurbs about her various major achievements. Then I paced around for hours, practicing a British accent as I told “my” story. No doubt my cats thought I was out of my mind. My first appearance was at the Mechanicsburg Mystery Bookshop in Mechanicsburg, PA, where I spun Florence’s tale for 90 minutes. I loved every one of those 90 minutes and continue to thrill at portraying the Lady with the Lamp. 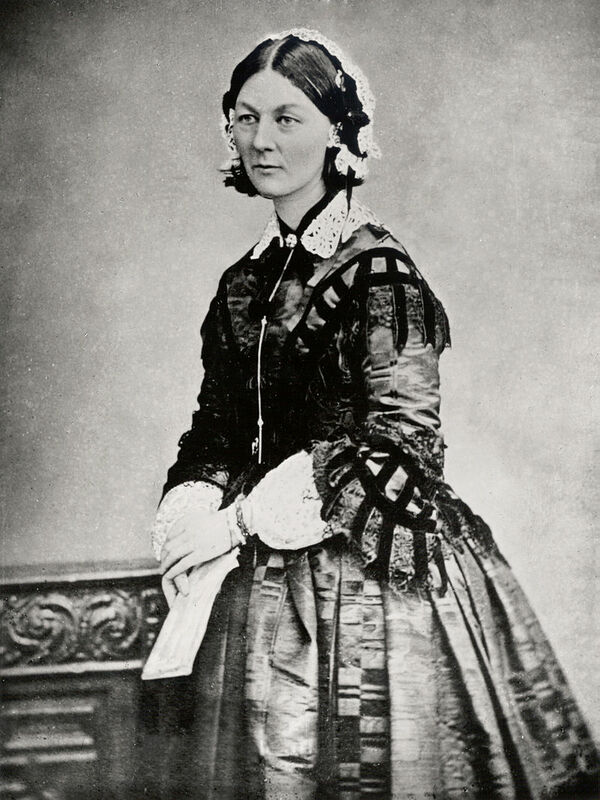 Do you know of a group that would enjoy having a visit from Florence Nightingale? I am available for private hire for nursing conferences, historical events, museum presentations, etc. Please contact me for details.